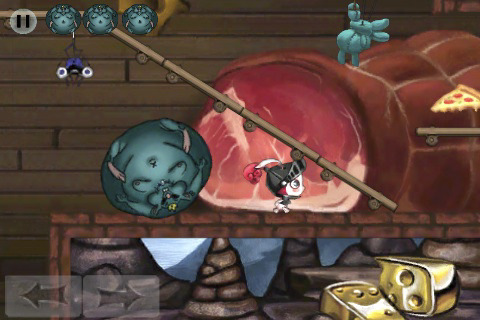 Plushed is a by-the-numbers platformer for the iPhone with exceptional art and some fairly challenging level design. As the young girl’s plush rabbit now brought to life, you’ll navigate you way through each level collecting golden ladybugs and helping fairytale folks solve their problems. One level features a family that has lost their son and some pigs in bales of hay. Another has crying babies in need of candy. As a young bunny knight in a fairytale kingdom, it’s your job to help these folks as you work your way towards saving your little girl. Controls in Plushed are both simple and responsive. You’ll have the option of touch or tilt control for directional movement, and tapping anywhere on the screen with make your little bunny jump. While responsive, the jumping wasn’t quite as perfect as we’d have liked it to be. There were moments in the game that became far more difficult than they needed to be due to the low height of the rabbit’s jump. Every now and then there’d be a certain enemy or chasm that would lead to our death because he simply couldn’t lift his rabbit feet high enough. As well, on more than one occasion jumping proved far more frustrating than it should have due to a few holes in the game’s otherwise excellent level design. A few unintended alternate paths stick out like a sore thumb and lead to jumps that seem possible but never are. One particular moment in the third stage had me ready to give up until I finally realized that this wasn’t the route the developers intended. Other situations like this crept up from time to time and marred an otherwise top notch experience. In addition to having a great deal of original personality and charm, Plushed pulls from the world of gaming and internet culture on more than one occasion to draw some inspiration for its fairytale world. The “pizza eaters,” a family of creatures that lets you complete epically large jumps, are a clear visual homage to Critter Crunch. Explore one level deep enough and you’ll find a character in appropriate attire doing the “peanut butter jelly time” dance of internet meme fame. There’s even a Doc Brown hiding up in the clouds. The unique characters and environments of Plushed are the highlight of the game in their own right, but adding in these delightful little homages felt like a perfect fit. The level design really comes together in the second half of the game and offers up some great platforming action. The downside is that the first few levels are so easy that some gamers might walk away before getting to the good stuff. There’s a gradual build in the challenge of the game that leaves the first 2 levels feeling like a little too much like a children’s platformer. Thankfully things ramp up from there. There are a number of boss fights you’ll tackle during the course of the games 9 levels, each of which showcases the skills you’ve learned up to that point. Boss battles are a real highlight in Plushed, as you’ll need to think each scenario out instead of simply exploring like you do in the rest of the game. Once you’ve finished your adventure, the package also includes 3 mini-games that you’ll unlock by earning golden ladybugs throughout the course of the game. Overall, despite the aforementioned issues, the art design in Plushed is wonderful, the level design was ultimately fun, and the in-jokes and pop culture references delightful. If you like twisted fairytales and fun, it’s going to be $1.99 well spent. Just try not to get too frustrated if you find yourself headed down the wrong path.